The Canon 5D is a versatile camera which accomodates a variety of application specific lenses. The camer shoots high resolution stills as well as full HD video. When it comes to delivering high-quality videography for facility tours, commercials, events, and documentaries, this Canon ensures that we have the best video quality. The Canon 5D Mark II features a 21-megapixel image on a full-frame sensor captured at 14 bits. It provides superior image quality for HD photo and video. The ISO is expandable to 25,600. It has a 3-inch, 920,000 pixel display LCD with a 170 degree viewing angle. The 5D records movies in 1090p HD (1920x1080) for 12-minute clips. The EOS 5D Mark II features a large, full-frame sensor. The 21.1-megapixel CMOS sensor shoots photos of up to 5616 x 3744 pixels.Its full-frame allows lenses to deliver the angle of view, without a conversion factor (similar to a 35mm). This is useful when shooting with wide-angle lenses. The EOS 5D Mark II offers Canon's highest ISO sensitivity to date, ranging from 100-6400 (expandable to ISO L: 50, H1: 12800 and H2: 25600) to shoot in poor lighting conditions. Noise reduction technologies allow for extremely smooth images, even when shot at highest sensitivity. The 5D is the first digital EOS to record full HD video in Live View Mode. It can shoot 30 minutes' worth of clips at full 1080 resolution. The settings also allow you to shoot at broadcast quality video. High-speed lenses and other shooting accessories that made EOS photography incredible can be used to shoot video. Interchangeable video lens on the EOS is an added bonus to this great camera. Processing power and speed. Canon's DIGIC 4 Image Processor speeds up intense operations such as Face Detection Live Mode, HD video recording, and lighting and lens optimization. Compatible with over 60 Canon EF lenses and EOS accessories. 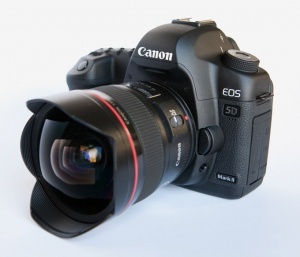 The Canon 5D's compatible with all Canon lenses in the EF lineup, from wide-angle super telephoto lenses.